Once upon a time, during a particularly rainy Geneva Summer in 1816, a group of intimates found in their possession German ghost stories, which they shared to scare away an otherwise dull confinement. And while these stories thrilled, they also inspired a contest of sorts. It was proposed by one man that they should each write their own ghost story to be read to see who might add to the chilling choice of entertainment of the time. There were five participants. The first two men lost interest in their own ideas and never finished. The third man picked up a discarded idea by the second man and created a short story. The fourth participant, a woman, was completely stumped and produced nothing. However, the fifth, another woman, struggled for several days and nights until one evening after witnessing a stimulating discussion of the “nature of the principle of life” she was unable to sleep as she was visited so vividly by images that formed a scene that she would eventually pen, becoming a classic for all time…and this month’s reading selection. This month, we shall read Mary Shelley’s Frankenstein, or The Modern Prometheus. Shelley created a deeply philosophical debate within the pages of her story about the essence of a man, and what makes a monster. She introduces the darkness that seduces a man to turn science into a tool to blaspheme the very nature of creation. Shelley’s work is astonishing for its depth given that she was but nineteen when she wrote it. As the daughter of the radical philosopher of the time, William Godwin and proto-feminist, Mary Wollstonecraft, as well as wife of poet Percy Bysshe Shelley, perhaps she was the nexus able to utilize and direct all that accumulated within her mind, making sense of things that otherwise would have been left unimagined. Frankenstein is part gothic novel, part science fiction. Mary Shelley had a way of seeing the possibilities of philosophical thought and scientific passion to a frightful conclusion. Much of our modern moral and social concerns that appear in literature and film harken back to those she raised in Frankenstein. Interestingly enough, there is another work by Shelley which is even now the inspirational spark for our zombie virus induced apocalypse fears. The Last Man is set in the twenty-first century, written as if it were the narrative of the sole survivor in a world decimated by plague. Mary Shelley began writing it in the spring of 1824. That was one lady who understood the darkness. 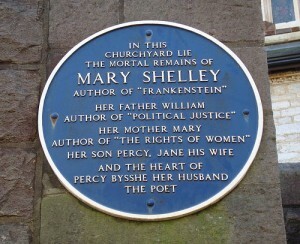 *Photo: Bournemouth…Mary Shelley by BazzaDaRambler, obtained through Flickr Creative Commons.